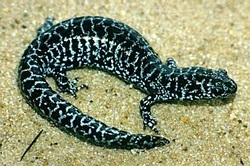 Flatwoods salamanders are moderately-sized salamanders that are generally black to chocolate-black with fine, irregular, light gray lines and specks that form a cross-banded pattern across their backs. Adults are terrestrial and live underground most of the year. They breed in relatively small, isolated ephemeral ponds where the larvae develop until metamorphosis. Mature salamanders migrate out of the ponds and into uplands where they live until they move back to ponds to breed as adults. The One-toed Amphiuma is listed as Rare and is protected in Georgia. Thomas and Grady counties may be the northern limit for this species. should be protected from drainage, siltation, and development. Very little information is available for this unusual species. Eggs are probably laid in June and July and hatch in late summer and early fall. It is unknown whether a larval stage exists for this species. Despite the presence of gill slits, one-toed amphiumas breath air by periodically protruding their snouts above the muck. These salamanders eat tiny clams, snails, aquatic earthworms, and a variety of arthropods. All seven of Georgia’s pitcher plants are state-protected. A carnivorous perennial herb, the hooded pitcher plant, like other pitcher plants, thrives in acidic soils of open bogs and sphagnum seeps of swamps. Reasons for decline of the hooded pitcher plant are fire suppression, and wetland draining, both resulting in habitat loss. Over collection has also resulted in a decline of the species. The hooded pitcher plant is differentiated from other Sarracenia species by its translucent windows located near the apex. These windows aid the plant in trapping insects that have entered the plant. The insects are sometimes fooled into thinking the windows provide a safe exit from the plant, but rather encounter a translucent wall and fall back into the plant to be digested.